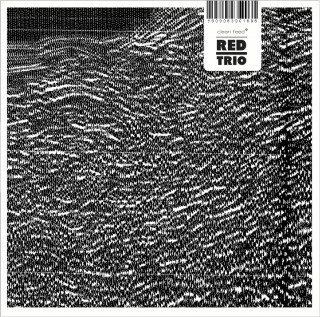 The RED trio is quite a unique case in the Portuguese jazz and improvised music scene. The free music played by Rodrigo Pinheiro (piano, prepared piano), Hernâni Faustino (double bass), and Gabriel Ferrandini (drums, percussion) have no attachment to anything else presented in the little European country known for its unusually dynamic jazz, improvised and experimental scenes. And even considering a wider scenario, few piano trios existing in the world can be comparable to what we find in this debut CD. Firstly, because this isn’t really a piano trio. The pianist is not the central figure here, even if we imediatly recognise Pinheiro’s resourceful and virtuosistic capacities, and the rhythm section, well, isn’t in fact a rhythm section, the bass and the drums always intervening side-by-side with the harmonic instrument. This is indeed collective music, with no hierarchical roles for the intervenients, and conventions like melody and pulse are generally subverted, or replaced by textural instant constructions. In the middle of all the abstractions created, the connections with jazz are not lost – truth is they surface with a welcomed evidence. Thelonious Monk and Cecil Taylor are recognisable, if distant, influences. The same we can say about the references to contemporary classical music, and namely to Messiaen and Ligeti. This is very intense music, sometimes even violent, but with space for detail. Quite a surprise, indeed.